Frisco was originally named Emerson, after Francis Emerson, who owned the farm where the townsite was located. Emerson, a McKinney banker, had promised to place a national bank in the town if it was named after him, but the bank was never established. Because the name Emerson resembled that of Emberson in Lamar County the town was renamed Frisco City, in honor of the St. Louis, San Francisco and Texas Railway Company, popularly known as the Frisco system, when the post office was established in 1902. The town name was later shortened. 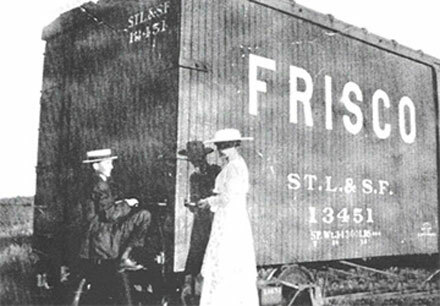 Frisco was incorporated during the first decade of the twentieth century and augmented by an influx of residents of nearby Erudia and Lebanon, who wanted to take advantage of the railroad line. Originally a retail and shipping point for farmers, Frisco had a number of cotton gins and grain elevators and was the home of a Farmers Co-operative Gin Association. By 1914 the population was estimated at 1,000. The Reinbert Electric Company began service to the community in 1913. In 1924 Texas Power and Light bought out Reinbert and in 1955 constructed a 110,000-kilowatt generating plant just outside of town on State Highway 289. In 1921 the Lone Star Gas Company organized the Farmers Gas Company in order to supply gas to smaller towns, including Frisco. The population grew steadily, from 618 in 1930 to 1,184 in 1960. In the 1970s, however, it increased rapidly, from 1,845 in 1970 to 3,499 in 1980. This increase was a result of the growth of Dallas and Plano, advancements in production of dairy products, small grains, and cotton, and new aeronautical production plants in the Dallas-Fort Worth area. 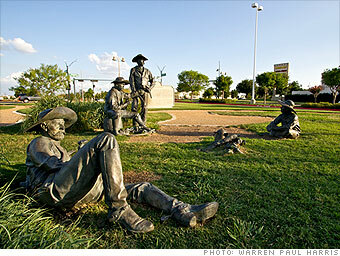 Although still a retail point for farmers, Frisco gradually became a suburb of Dallas. Frisco is home to the Frisco Roughriders, an AA minor league affiliate of the Texas Rangers MLB team, and FC Dallas, a major league soccer team. In 1990 the population was 6,141, and the community had spread into Denton County. In 2000 the population had increased to 33,714. Follow Housewarmers Frisco on Facebook to stay up-to-date with what’s going on in our community! Or get it delivered to your email inbox! Yes, I would like to receive emails from Housewarmers of Frisco. View a list of some of Frisco’s finest restaurants, home service and all-around businesses that Frisco has to offer. Welcome to the Community! See where Frisco has come from and what it has to offer. Do You Have a Business in Frisco?